Boxing Gloves Vs. MMA Gloves – What are the differences? 12 Comments on Boxing Gloves Vs. MMA Gloves – What are the differences? I know that many people wonder about the differences between Boxing and MMA gloves. There are actually many. Firstly sports are different and this alone changes everything. Below you will see vital differences of them, my experiences and at the end of the writing you will also find out which one delivers more impact. Firstly boxing gloves are bulkier because in this sport you just punch. And knuckles should be protected all the time. The padding disperses the shock throughout the glove and as a result, your knuckles will be “safer”. With that after you punch with an MMA glove, the padding will barely move. Even you throw your fastest punch, it actually stays almost stable. Whereas boxing gloves padding can change its place a lot. However, the padding returns the original state before the next punch. This is why the padding of a boxing glove has vital importance. Because if it does not return the original place quickly this can seriously jeopardize your knuckle and wrist safety. That is really necessary because boxers concentrate on throwing punches and they need the best protection possible for their hands. So the padding is softer and its quantity is way more than MMA gloves. And the padding type is also very different. The shock dispersing ability of boxing glove’s padding is much more than MMA glove’s padding. MMA has many striking, grappling techniques and this is why these are small and have way less padding. And because of some movements, the padding is also stiff and less. Well, here boxing gloves have certain advantages. Firstly the shock disperses just more throughout the boxing glove. Because boxing glove’s area and volume are way larger than MMA gloves. So the delivered shock to your wrists will be less while wearing boxing gloves. Secondly, boxing glove’s wrist part is exclusively designed for making your wrists to stay stable. By the way, some boxing gloves have incredibly large and tight wrist closure. When I wear boxing gloves I feel much safer with my wrists and I am sure that many of you felt that as well if you have tried both boxing and MMA gloves. Also when you compare boxing and MMA gloves let’s not forget that we use boxing hand wraps underneath the boxing gloves. These help you to disperse the shock and reduce the impact even more. Also, these help even more for your wrists to stay stable. I also know that so many people do training for just physical benefits and they are looking for a pair of gloves to use in their workout (heavy bag, double end bag, focus mitts etc.) And they want to have the best wrist protection possible. Then you should definitely go with boxing gloves. If you fall into this category, I highly suggest you have a look at these best boxing gloves. I am sure that there you can find a pair for your need. Which one provides more powerful punches? There is actually a video which Bas Rutten throws punches with bare hands, MMA gloves and boxing gloves. And they measure the force. As you can expect that bare-knuckles deliver the most powerful punch. However, the delivered force between MMA glove and boxing glove is just so little. You can find this video below. According to the video, the MMA glove creates more force. However, I want to say something here. In the video used boxing gloves are training type boxing gloves. As a side note, these can be used in any training type including double end bag, focus mitt, punching bag etc. However, let’s not forget that there are boxing gloves which are exclusively made for heavy bag session. There are some researches for force comparison of boxing gloves for heavy bag and MMA gloves however I could not find any decent research. But based on my and many people’s experience; comparing to training type boxing gloves I can easily say that you can make much more impact with boxing gloves for heavy bag sessions. However, is it more than the impact of MMA gloves? According to the research; the impact which is made by boxing glove is 641 kg. And the impact, which is made by MMA glove, is 651 kg. Of course, I did not do any scientific research or could not find any decent research about the delivered force of boxing gloves for heavy bag training. However, I can easily say that comparing to training type boxing gloves I can punch at least %5 – %10 stronger with a heavy bag pair. Let’s say that force of your punch is 300 kg. which is even less than 1/2 of Bas Rutten’s punch. The difference still would be 15 kg. Note: Also people tend to forget that even though boxing gloves for heavy bag have more padding this is designed for you to punch faster so you can be sure that when you punch with a heavy bag boxing glove, compared to training type boxing glove the force difference will be way more than 10 kg. So in my opinion, the result of the force is below. Obviously these are two different sports types and MMA also requires grappling. So MMA gloves are designed to do grappling so you can move your fingers easily. With that, these are also way more comfortable than boxing gloves. Boxing gloves can be tight and the liner can be stiff. Sometimes this can be a really unpleasant experience. Based on my researches this is directly related to the surface area of the object. MMA glove has a smaller impact area and also provides more impact so it is fair to say that MMA gloves definitely increase the likelihood of having cuts. Considering these facts we can conclude that boxing gloves provide much more safety than MMA gloves and MMA gloves generally provide slightly more force (except boxing gloves for heavy bag workouts). I hope that you enjoyed reading and if you have any questions, experiences please have a comment below. Previous post: Best Boxing Floor Mats – Which one is for you? That’s a well put together post on boxing gloves vs MMA gloves. I would have thought the impact would be so much harder with the MMA gloves because they have so much less padding. Nicely done. You are welcome man padding of MMA gloves are more denser but boxing gloves for heavy bag delivers the impact just a bit more. Looks like the boxing gloves punches are harder right? You can train with heavy bag gloves for punching faster(harder) Anis. You too man. 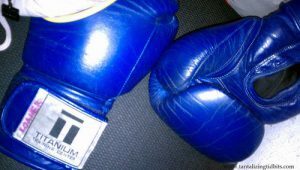 Hey Furkan,, Really cool post on boxing and MMA gloves. I think boxing gloves are just ok when it comes to kickbox training or boxing when you start grappling there is no way you can use them. However, I like to use boxing gloves when I train on bags, but in sparring, it really makes a huge difference because MMA gloves really only protect the hand. not the face of the opponents and an MMA fighter can also not use his gloves as a shield as boxers do. Plus I also think that MMA gloves are awesome to open your eyes in terms of punching inaccuracies. Even though boxers are usually more precise with their punches. I really did not do any kickboxing training once I punch the mitts with kickboxing gloves but it was a totally different experience. 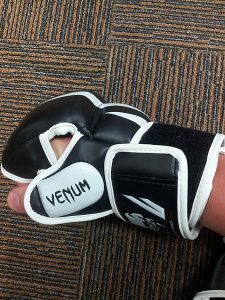 Anyway, actually you are wrong about MMA gloves, for example, there is Venum Elite MMA Gloves and it has lots of padding and protects your face during MMA sparring sessions. Sure the padding quantity is still less than boxing sparring gloves but it is quite soft and can be used for sparring. Hi. I am new to MMA. So basically it is safer to use boxing gloves rather than MMA gloves. Do you think that MMA will eventually make the move towards boxing style gloves, so that the fighters are safer in the ring? Although some people would disagree, I think safety should be high priority in all fighting sports. Thanks for this post, it was most helpful. It is kinda safer when it has lots of padding. A good example is boxing sparring gloves. I actually have no idea about it and don’t know whether they are trying to make MMA “safer”. So I can’t comment on that. I absolutely agree with your statement and if there is a way to it like changing the glove shape, I am all in. Whilst not being one of my favorite sports, after reading your post, I am getting a sense that there is a lot of things to consider in this sport. I never knew that you should think THIS much before selective a pair of gloves! Thanks for the informative article with a lot of cool tips! I actually try keeping these writings shorts because people generally don’t read them all lol. But I guess I covered everything above as a summary and you should keep in mind all of the things above while getting boxing or MMA gloves. Certainly, people who do heavy bag training as an exercise definitely learn a thing or two in this writing. Awesome that was quite interesting and detailed. You know a lot about this . Are you a professional boxer or did you ever box professionally? Even so the details were very interesting I bet many boxers don ‘t even know all the details. I have always been interested in the art of boxing. And knowing this really makes you think it is an art. I am just a guy who does boxing regularly and due to my passion, I started this site even though I earn only a couple of dollars per month I feel good when I provide information and help people. Yeah, I know. There are many guys, who are pro, ask me all kinds of questions about gloves and I try helping as much as I can. But they ask quite specific questions like does layered foam work etc. Whenever I compare boxing and MMA stuff someone definitely mentioned this fight. Man, it was really popular and even though I guessed that Mayweather would win, I was hyped up.